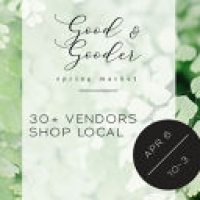 Shake off the winter blues and skip into spring at the Good and Gooder's Maker Spring Market! A fun, modern maker’s market featuring a curated selection of local makers selling handmade goods. Featuring 30+ artisans, makers, and small shop owners from all over the GTA and surrounding areas. Live music by Brent Miller Live. Find the perfect gift for your Easter wish list or enjoy the sights and sounds of a modern day market.